The Community Services Division at American University of Sharjah (AUS) organizes volunteering trips for students in various parts of the world. This semester, 20 students undertook a trip to Zanzibar from March 30 to April 6, 2019. The students volunteered in Muyuni Primary School where they taught and interacted with over 66 school children during school hours. The volunteers assisted in the learning process of children in grades four, five and six. They came up with innovative ideas, scientific approaches and a variety of games to enhance the learning process in areas of mathematics, science and English. The volunteers were successful in making a significant impact on the kids and left a positive impression on the school. The volunteers also participated in the renovation of the school, which involved the clearing and redesigning of offices and classrooms. They also painted the interior and exterior walls of four big classrooms, transforming the place completely. On their last day in Zanzibar, the volunteers handed over six metal cupboards and 25 chairs which they collectively bought and donated to the school. Forty-one laptops were also handed over which were donated by AUS through the efforts of the Student Council and the support of the AUS IT Department. Bidding farewell to the school children, the volunteers presented them with toys, stationery, sweets and gifts. The handover ceremony took place in the presence of Zanzibar media and a live broadcast. The trip also involved walking tours of the city and visiting historical and heritage sites. The tours in Stone Town and Muyuni provided the volunteers with knowledge of the history, culture and traditions of the country. “I am happy with the work we completed at Muyuni Primary School in Zanzibar. This volunteering trip helped me become more aware of real life issues that students are facing in different parts of the world. It also reminded me of how lucky I am to be where I am and to appreciate the things that I usually take for granted. It taught me to be more understanding, accepting and welcoming of people from different cultures and backgrounds. I also learned that I can do more than I thought I could. I encourage my fellow students to go through this experience at least once during their time here AUS. They will not regret it,” said Nadien Abdul Majeed , a senior mass communications student. “Volunteering empowers our students with qualities that aid in their self-development, in-depth understanding of different societal issues and the realization of self-fulfillment through voluntary and humanitarian deeds. 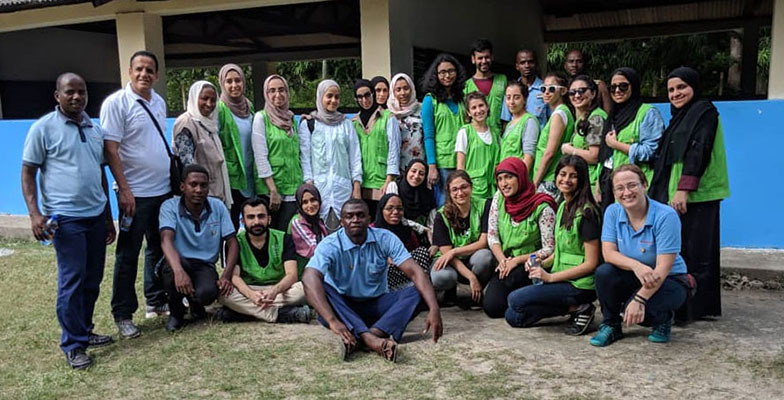 The volunteering trip to a developing place like Zanzibar was an eye-opener for our students and helped them appreciate and learn,” said Munketh Taha, Director of Student Development and Organizations Department at AUS. The student volunteering trip to Zanzibar was organized by the university’s Office of Student Affairs.